30 seconds. That's how long a hiring manager typically spends looking at your resume. It's essential that your resume be able to capture attention and highlight your skills at a glance. If not, you likely aren't even entering into consideration for the job you're after. What can you expect from our professional Resume Writing Service? From start to finish, you'll receive one-on-one attention – first from an expert resume consultant who will evaluate your existing resume, and then from a certified resume writer who has been carefully selected for you based on your industry and experience. They'll help you perfect your resume so it resonates with hiring managers, presents you as a strong, talented candidate, and most importantly, helps you land your next interview. So, how do we get started? It's simple. We'll start by giving you a free resume critique from one of our resume consultants. This will give us a clear understanding of exactly how much support you need. Your resume writing package will then be tailored to match your level of experience and specific needs. The path to a powerful resume starts here. We'll provide you with an honest, direct assessment of your current resume. One of our resume consultants will score your resume based on a qualitative evaluation of your content, structure, and other key factors. We'll email you a link to access your free evaluation. 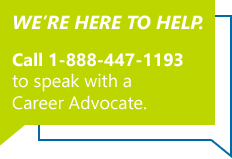 One of our Career Advocates will walk through your Resume Critique with you on the phone. You'll have a chance to discuss your specific needs to make sure you get the best results. If you decide that you'd like professional support to craft your resume, we'll provide you with a customized price based on your industry, experience, and needs. A side note: In some cases, we may feel that your existing resume is so effective that you don't need a full professional rewrite. If that's the case, we're still happy to offer you feedback to help make it even better. After you place your order, we'll start by asking you a few questions. Your resume writer will use all of the information they've gathered to create a powerful resume for you. You'll receive the first draft via email within 5 business days. This is your chance to ask questions and provide feedback. Once you're happy with your new resume, we'll send you the final version in the format that works for you. Score an interview in 90 days or less. For more than 10 years, we've worked closely with employers to understand what they look for in their new hires. Our expert resume writers put all that experience and insight to work for you, by effectively showcasing your skills and qualifications, optimizing your resume to get past an Applicant Tracking System (ATS), and generally helping you stand out as an amazing candidate. We're confident that we can help you – so confident that we're willing to stand behind a 90 day interview guarantee. Our team of certified resume writers will help you create the perfect marketing tool to land your next interview. What happens if you don't land an interview after 90 days? If you don't secure an interview within 90 days of receiving your new professionally-written resume, you'll have the chance to partner with a Career Advocate who will help you to step up your job search. They'll take the time to learn more about your approach and offer expert advice on how to overcome the obstacles you're facing. We'll also create additional exposure for your resume, all at no cost to you. Be a stand-out candidate every step of the way. There's a lot that goes into a successful job search. From a perfectly-crafted resume to a thoughtful and compelling thank-you note, we have writing services available to see you through the entire process. Our professional resume service will help you pass the 30-second test with hiring managers. You'll be matched with a certified resume writer based on your industry and experience and receive personalized, one-on-one service. Most importantly, you'll end up with the expertly-crafted resume you need to land your next interview. We can provide a cover letter that's the perfect complement to your new resume. In addition to communicating your job search goals and the value you have to offer, it will be crafted so that you can easily edit it for each position you pursue. After all, customization is the key to presenting yourself as a well-matched candidate. Yes, you can (and should!) follow up with an employer if you haven't heard back after applying for a position. We'll develop a follow up letter that reiterates your interest in the position and gives you another opportunity to secure the interview. This is a must-have for a positive, lasting impression post-interview. If you need help crafting yours, we can help. We'll provide you with an effective message that expresses your appreciation for the opportunity to interview and shares why you feel you are the best applicant for the position. Need your resume faster than our standard 5 business day turnaround? No problem, we have two expedited options to get your resume in great shape ASAP. I want to thank you again for all of your help. I am truly proud of this resume. I was apprehensive about hiring someone to rewrite my resume. But I must say that this was a true investment and well worth it. You are helping me to get one step closer to achieving my dreams! Thank you so much for your help! To be honest, I doubted my wisdom in spending money to have my resume "redone". I opened the draft and my fears quickly turned to tears of overwhelming joy. I am totally blown away. Was it worth the money, without a doubt. Wanted to let you know I got a ton of response from my new resume and 3 job offers last week! Thank you for helping to put my resume in front of people instead of lost in the mix. Thank you so much. I love the new resume and have been contacted by a few employers since I re-posted the new resume. Thank you very much for updating my resume. It looks fantastic!!! This was so very worth the price. I am in awe over the transformation. Now I know why there are professional resume writers. I labored on my resume for months, part of the time with a professional resume writer, and you were able to take my resume and questionnaire and create a resume that captures all of the important details! This was money well spent and it relieved me of what had become a real aggravation. Thank you for all your help. I have already had 6 job offers with the new resume. I appreciate all of your assistance and again, thank you. I've gotten 2 requests for phone interviews and have a face to face tomorrow. Great work! This is perfect. Thank you so much. I so appreciate your dedication to provide me with a resume that will get my foot in the door. Nexxt resume writing is well worth the money. I've been using the resume you wrote this week and guess what? Tomorrow, I have an interview for an events & communications job at a great company. Thanks for your great work! You made me look really good! I am happy to say that I have landed a wonderful, executive-level position. Thank you again to you and your team for your instrumental help getting my resume ready! Thank you so much for working on the resume; it looks great! The resume actually captures my career experiences and expertise very well. I love the cover letter. Thanks for all your help. I realized that I can no longer see the issues with my resume. Your help gives me a new perspective. I think it's much better than what I originally sent to you. I really like the way you have changed the look and feel of the resume. Thank you for what you have done so far. I feel more confident about my resume now. Once again I want to thank you and tell you that I could not have been happier with the wonderful work you did. I have already shown your work to my job counselor and recommended your service to other vets who might need it. Thank you so much. I am getting so many calls and compliments on the resume you wrote! Two recruiters said it was the nicest, most easy-to-read resume that they've seen in over 16 years in the business! I had a chance to look over my resume and thought, wow!! This is great! I feel like with this resume I'll be getting many calls. Thanks for a job well done. You're definitely good at what you do. Thank you for being so professional and friendly! Your words definitely reassure me. You'll be the first to know when I get a new great position! I think my resume looks amazingly different than it did before, so you achieved a remarkable make-over for me that I needed. Not only does it look much better, but I now feel much better and more confident (not to mention revived energy) on the tiring process of job hunting. I would like to thank you once again for the wonderful job you did with my resume. I am extremely satisfied with the results. I am very pleased with the resume and am excited to use this resume for my job hunt. I was desperate for an updated resume, and contacted several companies that showed no real interest in ME and my advancement. I decided to use Nexxt, and it was worth every penny I spent! The writer nailed it, and I could not be happier. I am confident I will get a job soon! I highly recommend this company to anyone wanting a very professional resume! I did find a job I'm pleased with and will start early June. I will definitely recommend you and your professional service as I'm sure it played a major part in me landing an amazing M&P Engineering position. First of let me thank you for doing a phenomenal job. My first reaction was WOW. Thanks again for this the great job you did for me. I have already been getting compliments on it; in fact I'm in the running for an awesome job where it's down to me an 1 other candidate. The very first time I used OUR Resume, I was offered the job! I am very excited and grateful for your assistance throughout the process. Thanks again. It was a pleasure to work with you on this project! I highly recommend Nexxt. They are value priced, deliver results in a timely manner, and offer great customer service. Thanks Nexxt for all your help... you made it super easy!! A few months back, you guys helped me with my resume. And happily, I have a new job!! You did an excellent job updating my resume, and it looks great. The entire re-branding of my resume has been a wonderful experience. I really appreciate your help and expertise. Thank you so much! I am highly satisfied with your service. You were a god send! Thank you for your excellent customer service! Just wanted to thank you and my assigned writer. Shortly after my resume was done, I had 2 interviews and now a job offer! Very good job, I will recommend the Nexxt resume service with no hesitation. Within one week of placing my resume on the internet, I not only got multiple interviews, I ultimately accepted a 6 figure full package offer from a non-published opening. The value pricing is right on the money, customer service was quick to respond and the social media advice was spot on. I was amazed at how well you made me sound in the resume. That is exactly what I needed! Thank you very much for your help and taking the time to make the resume personal to me and not just a cookie cutter resume. I would like to thank you and your staff for providing me with an awesome resume. It shows that you are all professional and experienced, and I am completely satisfied with the end product. The investment I made in having you do my resume was well worth the money; thank you again. I will absolutely recommend you to everyone. I want to compliment your efficiency and your talent. Thanks so much for boosting my confidence. You are "simply the best". Great doing business with Nexxt, worth every penny and more! My only regret is that I didn't know about this company and services sooner. Not only did I land an interview, but I was offered the position I interviewed for! I start in two weeks. I would happily recommend Nexxt to anyone. Thank you!! Thank you so much. I just got a call yesterday for an interview for a position that pays $75k. Without the new resume, I probably would have never landed the interview. I have had three interviews thanks to my new resume. After I put the resume out on job sites I had an interview within a few days, yesterday actually. So I just want to extend my appreciation; you were a tremendous help for me in my search for a job. Thank you so much. I cannot thank you enough for your amazing skill of converting my "plain" resume into a real professional resume. I am more than satisfied and happy. Thank you again, well worth the money. I'm doing great! After I received my resume back from you guys I applied for a position as a Director of Materials. Two days later I received a call for an interview and was hired within two weeks! I have been in the position for about two months now and I'm making good money with great benefits. Thank you guys so much for the help and I would highly recommend your services.